EDIT: Giveaway is officially over. Congratulations to Antonella for submitting the randomly chosen 248th entry! 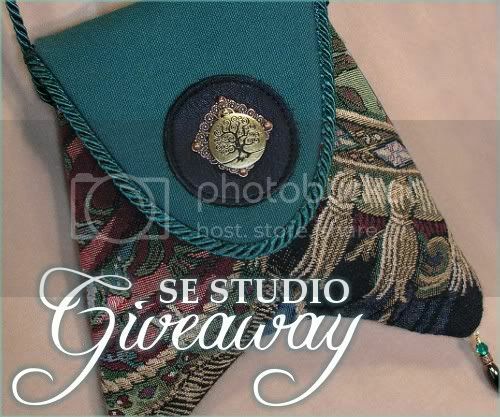 Jannelle grew this charming Tree Of Life pocket in her Something Else Studio for one lucky winner. The combination pocket can be worn with the 53" corded strap as a shoulder purse or strung through a loop in the back as a belt bag. Two hand-wrapped beaded dangles swing along the bottom. The 8" x 5" bag is fully lined with an inner pocket. A magnetic snap keeps the flap securely fastened to protect belongings. This one of a kind accessory is the perfect way to carry essentials at a Renaissance Faire or other spring festival. Jannelle's unique pocket design was inspired from Medieval and Renaissance times when clothing was not constructed with hidden pockets so flat bags were attached to belts, draped around the waist or over the shoulder instead. Art, history and imagination take flight in Jannelle's home studio. She designs enchanted accessories that transform the wearer from function to Fancy. From wearable art bags to fur trimmed cloaklets to fairy crowns, all are handcrafted and solidly constructed for years of use. Use the Rafflecopter below to enter to win Jannelle's handbag giveaway before 11:59pm EST on March 20, 2012. As a young creator.. I hope you don't think I'ma lurker haha, but I've been admiring your work since November!very inspirational.. I LOVE IT. carapacenator (at) gmail dot com. I adore the The Bigger Bag Tapestry Technology Computer Tote Adjustable Strap Shoulder Bag! beautiful works of art as a purse!!! Everything in this shop is gorgeous!! I'd be thrilled to own any bag! with that being said,my fav right now is is the handpainted Moonface on wood messenger bag. Thak you for this wonderful opportunity!! I like the shoulder/belt pockets, especially the Silver Filigree Popping Hearts. I love the Tapestry Owl Shoulder Bag! Christina - xristya@rock.com - The Swinging Asian Lampwork Tapestry one is my favorite! I enjoy the looks of the Jeweled Filigree Butterly Shoulder Purse. I so love the Swinging Artisan Lampwork Glass Tapestry Shoulder Fancy Pocket!! I LOVE the Steampunk Flair Diamond Bag. I like the sturdy purple heart canvas shoulder pocket. Thanks for the chance. My favorite is the Swinging Artisan Lampwork Glass Tapestry Shoulder Fancy Pocket. I love the Woodland Berry crown! Boy! That was hard to narrow down! I decided my first love is the Sturdy Canvas And Tapestry Purse With Brass Heart Valentine Jeweled Shoulder Pocket And Belt Pocket Combination. I love the tapestry capelet! Everything is so pretty! i love the crowns--Gypsy Princess Goddess Red Velvet & Gold Circlet Headdress is my favorite! I love the Ornate Fringed Peacock Mystery Book Tote! wow, this is one amazing shop! I like the Tapestry Jasper Gemstone Bag. Everything is pretty! I like the Special Edition Fiber Art Finn Bag Wool Felted Green Man Denim Shoulder Bag a lot! The Hand Painted Celtic Knot Purse is beautiful! I like the NEW Woodland Fae Green Tapestry Combination Shoulder And Belt Pocket. I like the Set Your Heart Free Sturdy Jeweled Pocket Shoulder Bag. I love Special Edition Hand painted Moon Face On Wood Wearable Art Shoulder Messanger Bag. Thanks. Lubka K.
I have so many bags...my obsession...but I don't have anything as unique as the Woodland Fae Green Tapestry Combination Shoulder And Belt Pocket. Absolutely gorgeous! I love the Special Edition Wearable Art Painted Purse Tree Of Life Big Messenger Bag. The Tapestry and Fur Trimmed Cloaklets, especially the hooded one, are so very appealing to me. Luscious plus! The Tree Of Life Big Messenger Bag has to be the prettiest bag I have seen in a while. It definitely has my current bag beat! I like the Hand Painted Jewel Tone Steampunk Victorian Face Hardwood Pocket Mirror. I love you work, it is so beautiful. I actually came to know about you because my friend is one of your models. out of everything my favorite is the bag posted for the giveaway, i love that purse it so awesome! Beautiful and creative! I love the Green Man felted tapestry shoulder bag! I like Old World Charm Valentine Heart Shoulder Pocket Satchel. Thanks for the chance to win! I also really love the Goddess of the Green Earth & Night Sky purse. I like Goddess of The Green Earth! I really like the Special Edition Hand painted Butterfly Mask Wearable Art Shoulder Messenger Bag.